Many Christians today are unaware of the invisible war they face on a daily basis—but the first step to conquering your enemy is knowing his tactics. In this engaging four-part series, Dr. Michael Youssef provides a Biblical understanding of Satan's strategies and the simple truths we can apply in order to defeat him. How can you guard yourself against deception? What does the Bible say about heaven, hell, angels, and demons? Dr. Youssef shares valuable insights that will shape the way you understand spiritual warfare. Utilizing a seven-point counteroffensive, you'll be equipped to conquer as you put on the full armor of God. 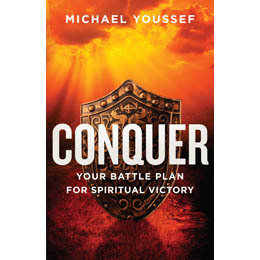 Note: Conquer is the teaching series companion to Dr. Youssef's book, Conquer: Your Battle Plan for Spiritual Victory.